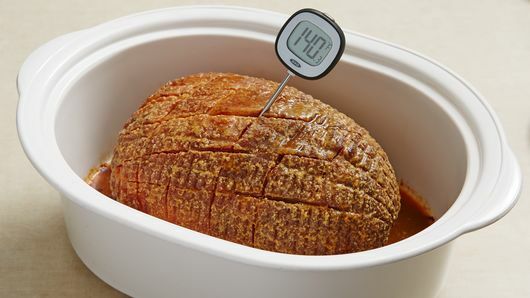 A large slow cooker, with its moist environment, is the perfect choice for reheating a fully-cooked ham. As it heats up the glaze is absorbed into the outer skin of the ham, while the ham releases juices that blend with the glaze, creating a sauce to spoon over the sliced meat. Ham can be bought in different ways. A fresh ham is raw and uncured—needing to be roasted before serving. A dry-cured ham is buried in salt, often with some sugar and spices and is air dried—prosciutto is a type of cured ham. For this recipe look for a fully cooked, wet-cured ham that’s been soaked or injected with a spiced brine. It only needs to be cooked to an internal temp of 140°F. Use real maple syrup; it's more expensive than maple-flavored corn syrup, but the flavor it delivers is worth the investment. Have leftover ham? Don’t toss it! There are plenty of next-day dinner ideas you can make with cooked ham like Ham Bone Soup and Ham and Cheese Sliders . Slow cooker ham gets a ham glaze brown sugar maple syrup makeover, and it elevates humble ham to an entirely new level of deliciousness. You’ll want to make this ham recipe your go-to party dish. Made with just four ingredients and requiring minimal prep time, it’s the easiest way to make delicious. Whether serving it to a crowd during the holidays or making it for a special family meal, this flavorful recipe is a guaranteed hit. 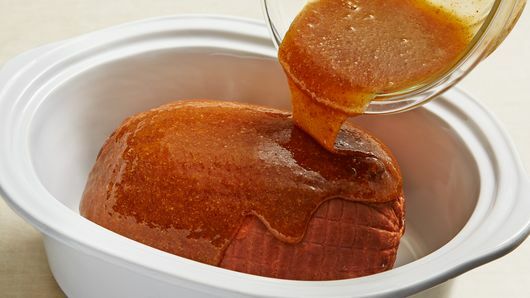 Cooking the ham in the slow cooker keeps it moist and flavorful without fear of drying out, and the maple-brown sugar mixture makes a fantastic sauce to serve with the ham. If you’d like to learn more basics, check out our guide on How to Cook Ham, which covers choosing a ham, carving it and even some inspiring ideas on what to do with leftovers. 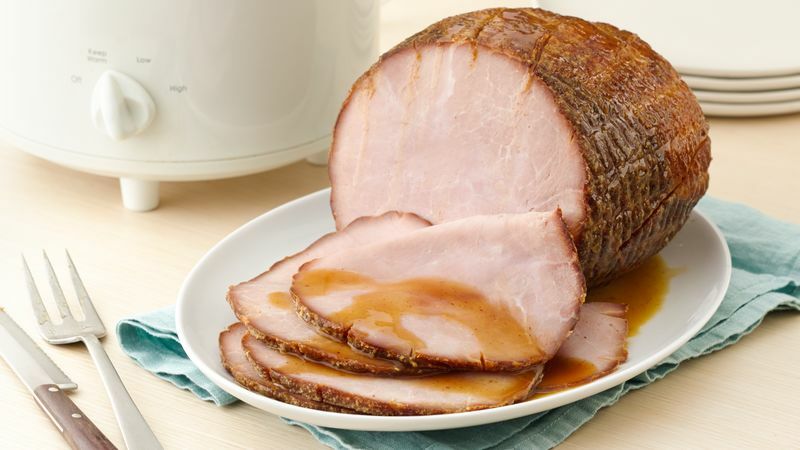 If this maple glazed ham recipe has you interested in trying more, check out our slow cooker ham recipe collection.